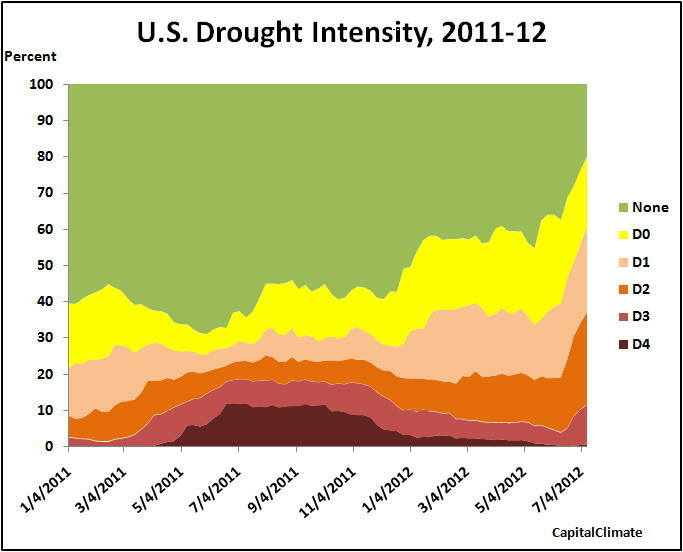 Despite increased rainfall, the latest U.S. Drought Monitor report, released this morning, shows that the area covered by some level of drought increased to 80% in the week ending July 10. This is up from 76% last week and is the highest dryness at least since Drought Monitor statistics began in 2000. Although D4 (Exceptional) coverage is still well below the extremes reached last summer, drought area increased for all levels except the lowest, D0 (Abnormally Dry). CapitalClimate analysis of National Weather Service data from 215 major reporting locations across the 48 contiguous states shows that total precipitation for the week ending July 7 was just 51.5% of normal. Weekly precipitation was less than 0.25" at 125 stations, or 58% of the total locations. Rainfall was more abundant than last week. A broken pattern of moderate to locally heavy rains (isolated totals up to 5 inches) covered the central and southern Plains, the northernmost Plains and Great Lakes region, the immediate Ohio Valley, and a good chunk of the Southeast and interior mid-Atlantic. However, the heavier amounts were fairly isolated, and with the hot weather that covered much of the central and eastern United States, only a few scattered areas of dryness and drought experienced significant improvement. In addition, the areas with the greatest temperature anomalies (average daily maxima 10 to 13 degrees above normal) generally coincided with an area of scant rainfall across the Midwest, northwestern Ohio Valley, and southern Great Plains, resulting in another week of widespread deterioration and expansion of dryness and drought in these regions. The lead story of last night's PBS NewsHour covered recent extreme weather events in the context of global climate change. The 8-minute segment included an extensive interview with Thomas Karl, Director of the National Climatic Data Center. In a stunning reversal of recent churnalistic practices, the message was not diluted by representation of phony skepticism (except in the spittle-flecked comments online). The real question, of course, is what happens to coverage of the issue when records are not being broken so spectacularly. 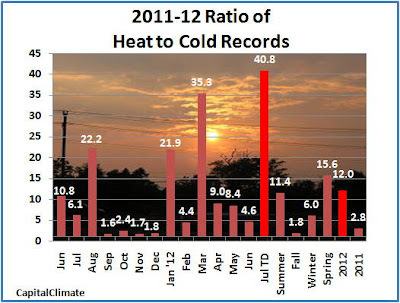 JUDY WOODRUFF: The past 12 months are the warmest ever recorded in the United States since record-keeping began in 1895. That word comes as a new report from the National Oceanic and Atmospheric Administration says climate change, including human factors, has increased the odds of extreme weather. . .
Watch Extreme Weather Records 'Like a Baseball Player on Steroids' on PBS. See more from PBS NewsHour. Dr. Michael Mann was interviewed on Washington's NewsChannel 8 this morning regarding his book, The Hockey Stick and the Climate Wars. The climate scientist received top billing over the tax cut food fight. Preliminary data from 215 National Weather Service stations indicate that the 48-state contiguous U.S. average temperature was above normal for the 30th consecutive week in the 7 days ending yesterday (July 7). The Pacific coast was the only region with significantly cool temperatures while the heat intensified from the Midwest through the Mid Atlantic and Northeast. 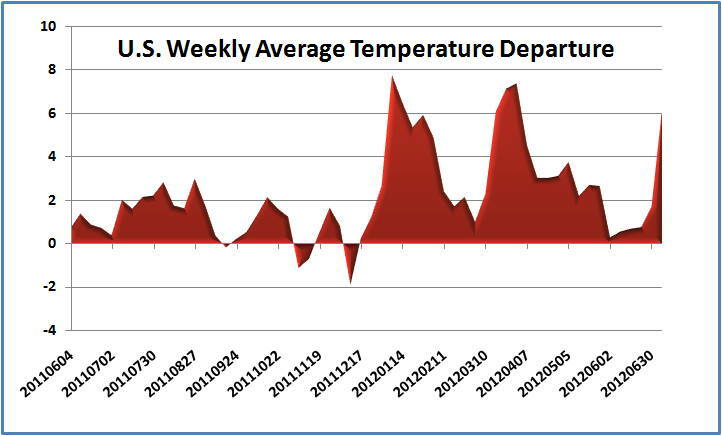 The weekly unadjusted average was 6.1°F above the 1981-2010 climatology, up from 3.9°F the previous week. 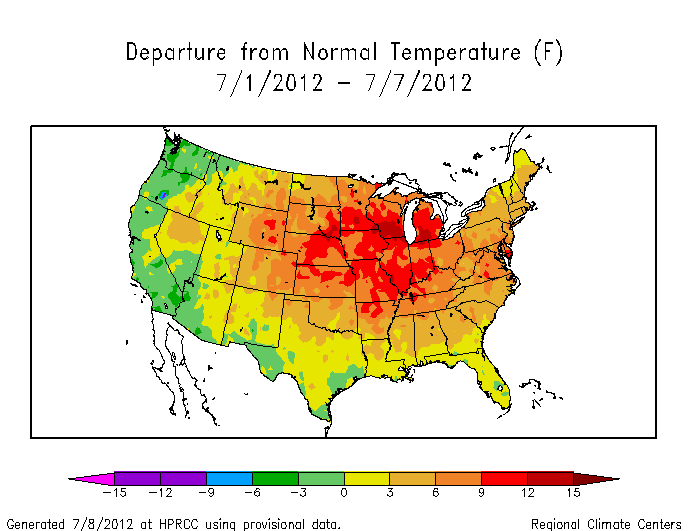 Over 90% of locations were warmer than average. The warmest locations were Chicago and Rockford, Illinois; Grand Rapids, Michigan; and Madison, Wisconsin, each at +15°F and the coolest was San Diego, California at -5°F. No other location was more than 2°F cooler than average. 9 PM Update: Later reports for July 7 have raised the July to date ratio of heat records vs. cold records to almost 41 to 1 (chart updated). Based on preliminary National Climatic Data Center reports through mid morning, new daily record high temperatures for the first week of July have outnumbered low records by an incredible ratio of 38.7 to 1. However, yesterday's (July 7) reports are still incomplete. The chart will be updated when more data are available.